Published in the South Kent Gazette, 26 September, 1979. Concerning the other houses on the same side above the gate, there is little to he said. No. 176, the site of “the gate“ was, in the 1840s, called the Wellington Rooms, and occupied by Mr. T. A. Terson as an auction office and sale rooms. On the south side of this part of the street, at No. 12, was for many years the premises of Amos, the celebrated photographer and amateur archaeologist. Earlier it was the business establishment and residence of Mr. Charles Lamb, a well known auctioneer in the early part of last century, who was Mayor in 1852. He was best known in connection with the Dover Catch Club, of which he was chairman fifty years. His neighbour on the upper side was Mr. William Horsnail, a man of a different type, who helped to found the earliest Dover Temperance Society, and was the founder of the first Temperance Hotel in this town, in 1841. No. 13, until late in the 19th century, was a private residence, and was for many years occupied toy Mr. W. P. Elsted, one of the first Magistrates put on the Commission of the Peace for Dover after the days of the Jurats. No. 14 was a lawyer’s office for a century at feast. In the early part of the 19th century it was the office of Mr. Gravener, solicitor and Clerk to St. Mary’s Vestry. No. 15, once the Dover Savings Bank, recalls the very good work done in Dover to that institution. Turning back to the end of the year 1846, it appears that there were £58,419 lodged in that Savings Bank, deposited by 2,007 persons, and that 359 female domestic servants had then in the Bank £11,102. The Bank, however, was not at No. 15 at that time. In 1847 it was the residence of Mr. W. Sutton, the organist of St. Mary’s Church, a man of some local importance. At the next house, Snargate House, was a stone recording that Snar Gate stood there, and was taken down in 1683 by order of the Mayor, William Stokes. For many, many years Snargate Street was the centre of business in Dover. Entering the street in 1900 one met the following: Nos. 1 and 2, booksellers; 3, hairdresser, tobacconist and wine merchant; 5, the “Sweeteries;“ 6, ironmonger; 8, hosier; 9, butcher; 10, bootmaker; 11, furnisher; 11a, coal merchant; 12, photographer; 12a restaurant; 13, antique dealer; 14, solicitors and county court office; 17, Dover Standard printing works; 18, hairdresser; 19, cleaners; 20, confectioner; 20a, florist; 21, draper and Wellington Hall navvies’ mission; 22, confectioner; 24 and 25, both tobacconists; 27, tailor; 28, shoe shop; 29, "Gothic Inn;" 30, "Grand Sultan Inn"; next door a clothier and the Theatre Royal (later site of "Hippodrome" Theatre); 35, bill posting firm; 36, tobacconist; 36a, butcher; 37, cycle agent and hairdresser; 38 piano warehouse; 39, baker; 40, builder; 42, butcher: 43, wool shop; 44, restaurant; 45. corset maker and boot repairer; 46, hairdresser; 47, "Clarendon Hotel"; 50-52, "Apollonian Hall" public house; 53a, tailor: 54, stationer; 55, herbalist; 56, bootmaker; 57, umbrella maker; 59. baker; 60, butcher; 62, tobacconist: 63, fishmonger; 66, tailor; 67-68, watchmaker; 69, grocer: 69a, butcher; 70, greengrocer; 71, plumber and painter; 72, "Duke of York" and "Duke of Cambridge" public houses: 74, cafe; 75, "Lord Wolseley" public house; 76, grocer; 77, "Mitre Inn"; 77a, ironmonger; 78, stationer; 79, Meteor Restaurant; 82, greengrocer; 83, electrician; 84, baker; 87, bootmaker; 89, convalescent home; 92, "George Hotel"; 93, tobacconist and engineer; 94, painter; 95, meat contractor; 97, cleaners and coal merchants; 104, chemist and, at this point, one arrived at the entrance to the Grand Shaft spiral staircase to the old Western Heights barracks. Further on were more tobacconists, grocers, including Bottle and Gandy, drapers, ironmongers, outfitters, the Dover Observer printing works, a toy shop, gun maker and cycle dealer, milliner, public houses, another photographer, china and glass warehouse and a wine merchant The street continued to be an important business and shopping centre until war damage destroyed most of the seaward side of the street and caused other business to close down. Today it is a shadow of its former self. 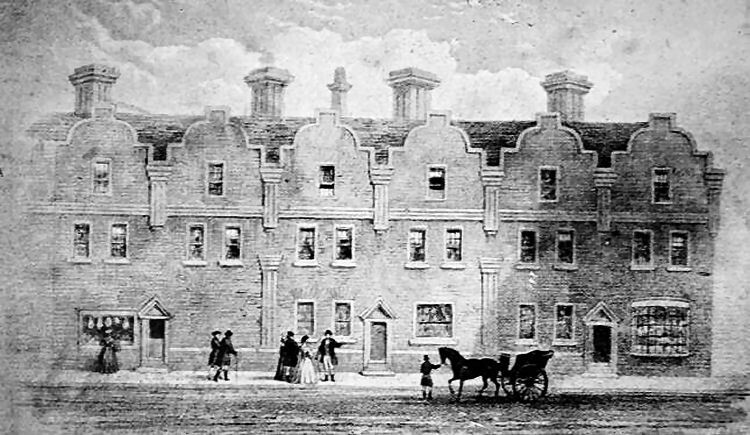 The Snargate Street birthplace, in 1690, of Philip Yorke, who, called to the bar in 1715, rose to become Lord Chancellor in the short space of 22 years — at the age of 47. He had earlier been made Solicitor-General, Chief Justice of the King’s Bench and was created Lord Hardwicke. On the south-west side of the Market Place were the Lanes, which lead through the very oldest part of Dover. There are numerous lanes in Dover still, but in days past there were many more, for a lane, according to the dictionaries, is a narrow street and nearly all the streets were originally narrow. “The Lanes“ have a distinction above ordinary lanes; they were not bye-ways which few frequented, but much-used thoroughfares where some of the best commercial houses of the town were situated. The Lanes were six in number — two in the old Bourman’s Ward and four in Snargate Ward. The two in Bourman’s Ward are now called Market Lane and Last Lane. These thoroughfares existed before the days of vehicular traffic, and possibly are older than their names. For instance, Market Lane owes its present name to the fact that it leads to the Market Place; but previous to a.d. 1479 the Market was at the sea end of Bench Street, therefore at that date Market Lane was not the lane leading into the Market. St. Martin’s Lane would have been more appropriate. About the origin of the name of Last Lane there has been much discussion. Some have supposed that the name is derived from the last used in the shoemaker’s establishment of Messrs. Coulthard and Wilson, which dates back to a.d. 1710, and that may be so, for in earlier times it was called Bourman’s Lane. 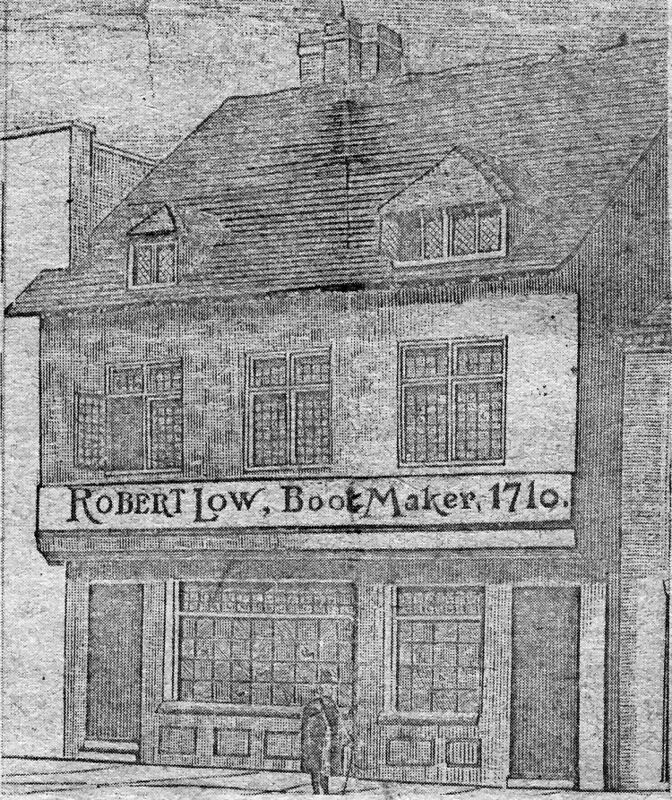 The bootmaker’s last used at the premises of Robert Low, whose business later became Coulthard and Wilson, is thought to have been the origin of the name of the once busy thoroughfare, Last Lane. Market Lane is short. On the west side were, for many years, the premises of Messrs. Dickeson and Co., wholesale grocers and provision merchants, and on the east side, at the comer of Queen Street, the restored premises of the old Seamen’s Hospital. Messrs. Dickeson’s premises were on historical ground and an ancient sculptured head, supposed to be Roman, was dug up during excavations in 1915. Market Lane in Saxon and early Norman times was a part of the precincts of the Monastery of St. Martin-le-Grand, and doubtless the old stone building on the east side, which the late Sir Richard Dickeson carefully restored, had been originally a part of the old Monastery. After the dissolution of religious houses this land passed into private hands, and, in the time of the Commonwealth, Captain Samuel Taverner possessed it, and had a dwelling house on the north-west corner adjoining St. Martin's Church. The name Taverner is an old one in mid Kent, but it does not occur in Dover before the Civil War, when Samuel Taverner was captain of a troop under Cromwell; and it was after the establishment of the Commonwealth that he settled in Dover. During his residence here he was appointed Governor of Deal Castle, which post he held until the Restoration. The Kentish Taverners appear to have been people of good position, but of Captain Samuel Taverner nothing particular is known except that he became a convert to the Baptists after hearing a sermon preached by Mr. Edward Prescott, of Guston.